If you desire to do well, have no dealings with these. Julius Caesar (1599), II, ii. The sly rectangle’s too licentious love! Three bright-ey’d Nymphs requite his flame by turns. Strange force of magic skill! Combined of yore. 'The Loves of the Triangles. A Mathematical and Philosophical Poem', in The Anti-Jacobean or Weekly Examiner, Monday 16 April 1798, 182. [Written by George Canning, Hookham Frere, and George Ellis]. 'Residence at Cambridge', The Prelude, or, Growth of a Poet's Mind: An Autobiographical Poem (1850), Book 3, 57-58. 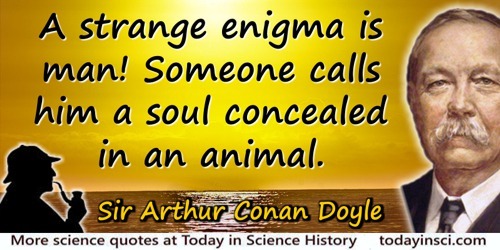 At first it seems obvious, but the more you think about it the stranger the deductions from this axiom seem to become; in the end you cease to understand what is meant by it. As quoted, without citation, in Stories about Sets (1968), 84. But if any skillful minister of nature shall apply force to matter, and by design torture and vex it, in order to [effect] its annihilation, it, on the contrary being brought under this necessity, changes and transforms itself into a strange variety of shapes and appearances; for nothing but the power of the Creator can annihilate, or truly destroy it. As quoted in M.J. Gorton, 'The Weather', Popular Science News (1889), 23, No. 8, 115. Dialogue by Hotspur to Glendower, in King Henry IV, Part I (c. 1597), Act III. Scene 1. Eugen Bleuler (who in 1911 coined the word 'schizophrenia') once said that in the end his patients were stranger to him than the birds in his garden. But if they're strangers to us, what are we to them? Hurry Down Sunshine (2009), 26. In 'Technology and Science', Stephen V. Monsma (ed. ), Responsible Technology: A Christian Perspective (1986), 78-79. And many a monster antique. 'Ballad of the Ichthyosaurus', Dreams to Sell (1887), 14. I always dreamed that man was a stranger on this planet. It is said that fact is sometimes stranger than fiction, and nowhere is this more true than in the case of black holes. Black holes are stranger than anything dreamt up by science fiction writers. In Lecture, 'Into a Black Hole' (2008). On hawking.org website. 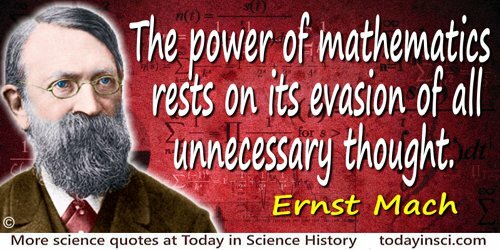 It is strange that we know so little about the properties of numbers. They are our handiwork, yet they baffle us; we can fathom only a few of their intricacies. Having defined their attributes and prescribed their behavior, we are hard pressed to perceive the implications of our formulas. In James R. Newman (ed. ), 'Commentary on The Mysteries of Arithmetic', The World of Mathematics (1956), Vol. 1, 497. 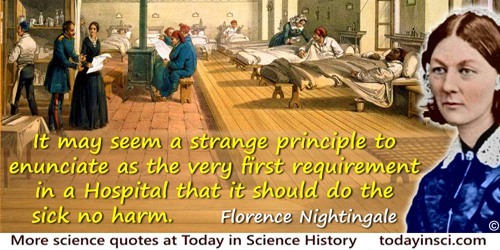 First sentence of Preface to Notes on Hospitals (1859, 3rd. Ed.,1863), iii. It seems very strange … that in the course of the world’s history so obvious an improvement should never have been adopted. 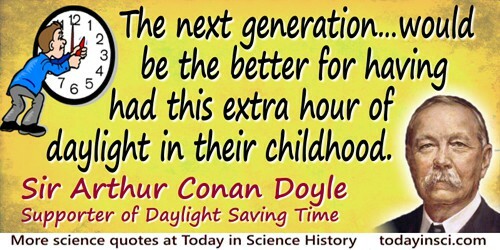 … The next generation of Britishers would be the better for having had this extra hour of daylight in their childhood. In Report, and Special Report, from the Select Committee on the Daylight Saving Bill: Minutes of Evidence (1908), 116. It’s easier for a woman to go into a strange village than a man. If a strange man wanders in, the natives are afraid he’ll take their wives away, but a woman can work with the mothers and children. Explaining her ability in observing Pacific Island cultures. As quoted in Frances Glennon, 'Student and Teacher of Human Ways', Life (14 Sep 1959), 143. Mathematics is strange: many make thousands but not many make millions. In Evan Esar, 20,000 Quips and Quotes, 250. Physicists are people, differing from the common run of humanity only in that from time to time they tend to speak a strange language of their own, much of which they understand. So I travelled, stopping ever and again, in great strides of a thousand years or more, drawn on by the mystery of the earth’s fate, watching with a strange fascination the sun grow larger and duller in the westward sky, and the life of the old earth ebbing out. In The Time Machine (1898), 160. That scientific work should be more useful the more it has been used, while mechanical work is expended in use, may seem strange to us. From 'The Economy of Science' in The Science of Mechanics: A Critical and Historical Exposition of its Principles (1893), 488. The mind likes a strange idea as little as the body likes a strange protein and resists it with similar energy. 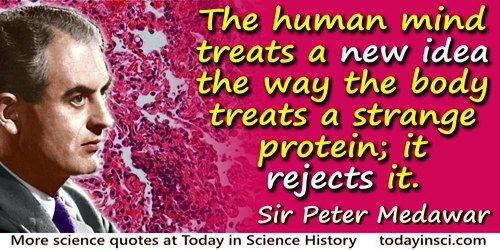 It would not perhaps be too fanciful to say that a new idea is the most quickly acting antigen known to science. If we watch ourselves honestly we shall often find that we have begun to argue against a new idea even before it has been completely stated. In Report on the Geology of the High Plateaus of Utah (1880), 113. There are many strange and wonderful things, but nothing more strangely wonderful than man. First line of a choral ode in Antigone, line 332, as translated by Ian Johnson. One of several variations given in Bernard Stiegler, Technics and Time, 3, (2010), 237. In poem, 'Miracles', Leaves of Grass (1867), 336. To us, men of the West, a very strange thing happened at the turn of the century; without noticing it, we lost science, or at least the thing that had been called by that name for the last four centuries. What we now have in place of it is something different, radically different, and we don’t know what it is. Nobody knows what it is. From La Science et Nous (1941), translated as 'Classical Science and After', in Richard Rees (ed. ), On Science, Necessity and the Love of God (1968), as quoted and cited in Robert Andrews, The Columbia Dictionary of Quotations (1993), 809-810. Also seen translated as, “Something happened to the people of the Western world at the beginning of the century, something quite strange: we lost science without even being aware of it, or at least, what had been called science for the last four centuries. What we now have under this name is something else, something radically different, and we do not know what it is. Probably no one knows what it is”, collected in Simone Weil: Late Philosophical Writings (2015), Chap. 10. We do not know how the scientists of the next century will define energy or in what strange jargon they will discuss it. But no matter what language the physicists use they will not come into contradiction with Blake. Energy will remain in some sense the lord and giver of life, a reality transcending our mathematical descriptions. Its nature lies at the heart of the mystery of our existence as animate beings in an inanimate universe. In 'Energy in the Universe,' Scientific American, September 1971 [See William Blake]. We have found that where science has progressed the farthest, the mind has but regained from nature that which the mind has put into nature. We have found a strange foot-print on the shores of the unknown. We have devised profound theories, one after another, to account for its origin. At last, we have succeeded in reconstructing the creature that made the foot-print. And Lo! it is our own. [Oppenheimer is] tense, dedicated, deeper than deep, somewhat haunted, uncertain, calm, confident, and full, full, full of knowledge, not only of particles and things but of men and motives, and of the basic humanity that may be the only savior we have in this strange world he and his colleagues have discovered. In Due to Circumstances Beyond Our Control by Fred W. Friendly (1967). … to explore strange new worlds, to seek out new life and new civilizations, to boldly go where no one has gone before.